Over the past few days, I have been investigating how SSD (Single Shot Detector), an object detector introduced in the following paper (https://arxiv.org/pdf/1512.02325.pdf) in Dec 2016 that claims to achieve a better mAP than Faster R-CNN at a significantly reduced complexity and achieves much faster run time performance. I’ll describe the details of SSD in a subsequent blog. The purpose of this blog is to describe the data augmentation scheme used by SSD in detail. According to the paper, the use of data augmentation leads to a 8.8% improvement in the mAP. Data augmentation is particularly important to improve detection accuracy for small objects as it creates zoomed in images where more of the object structure is visible to the classifier. Augmentation is also useful for handling images containing occluded objects by including cropped images in the training data where only part of the object may be visible. The following data augmentation steps are used and are applied in the order listed. Note that contrast is applied in RGB space while hue and saturation is applied in HSV space. Thus the appropriate color space transformation must be performed before each operation is applied. Application of contrast, hue and saturation is done in a manner similar to brightness. Each distortion is applied with probability 0.5, by selecting the distortion offset randomly between an upper and lower bound. The code for applying saturation distortion is shown below. For a RGB image, the swap (0 2 1) would involve swapping the green and blue channels, keeping the red channel unchanged. The swap that is actually applied is chosen randomly from this array. 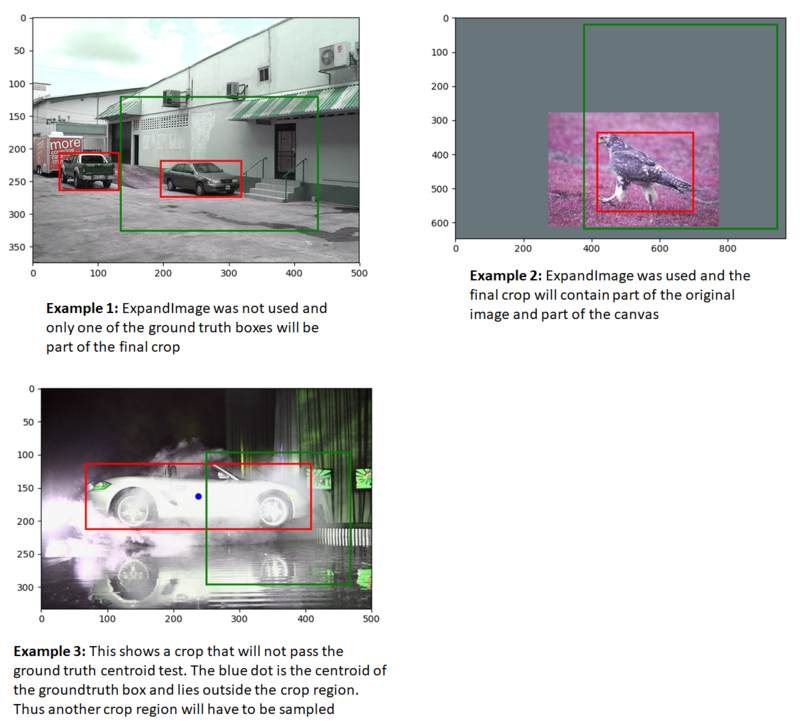 The goal of this step is to crop a patch out of the expanded image produced in ExpandImage such that this patch has some overlap with at least one groundtruth box and the centroid of at least one groundtruth box lies within the patch. This requirement makes sense as patches that don’t contain significant portion of foreground objects aren’t useful for training. At the same time, we do want to train on images where only parts of the foreground object are visible. 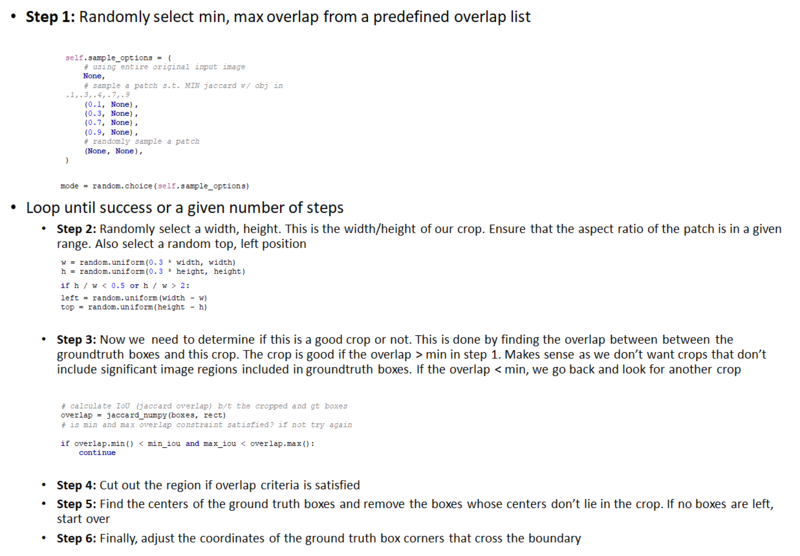 The steps carried out in RandomCrop are shown in the figure below. Let’s now look at a few examples to further illustrate these ideas. Ground truth boxes are shown in red while the cropped patch is shown in green in the images below. Recall that the RandomCrop step follows the ExpandImage step, which is applied with probability 0.5. So some of these images have an expansion canvas around them, while others don’t. The last augmentation step is RandomMirror. 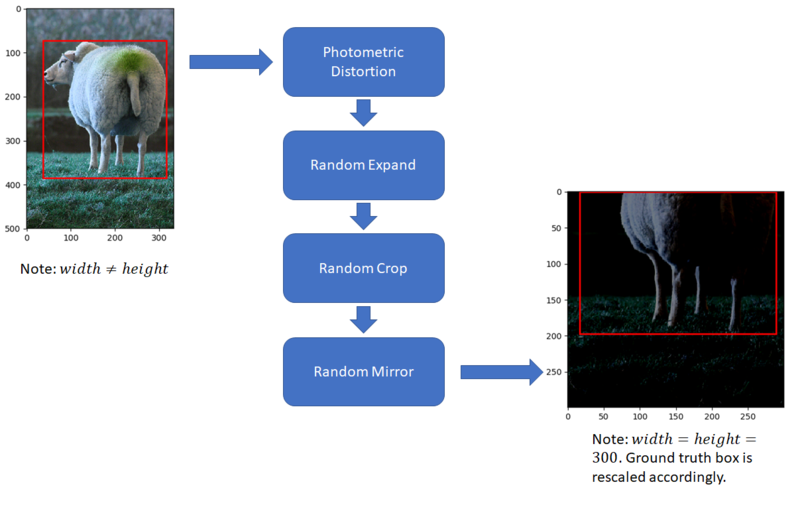 This one simply involves a left-right flip and is a common augmentation step used in other object detection and image classification systems also. 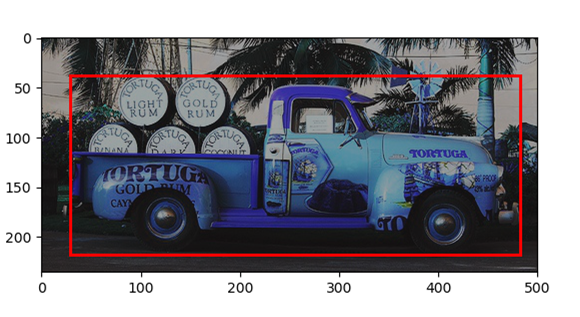 Finally, as in other object detection and image classification systems, the image is resized to 300, 300, ground truth coordinates are adjusted accordingly and normalized and mean is subtracted from the image. Is the process creating a blank image and placing a small version of original image on it?